September 2004 sees a deserved month in the spotlight for the unassuming Porthole Catfish. Shipments of this species have not been as common of late although the species is widespread and commonly encountered in its native tropical South America. This just goes to show that no matter what, if you like a catfish and have the space for it in your tanks, you may as well buy it while you can, as you never know when you might, or might not, have the opportunity to purchase them again. This is especially true of the Porthole Catfish; it belongs to the genus Dianema that is remarkable in the armoured catfish family for its little documented reproductive habits. This and its only other congener, D. urostriatum (the Flag Tailed Porthole Catfish) have been the subject of fleeting reports of bubble nest building or sexual dimorphism but spawning accounts are hard to come by. Both species of Porthole Cats, so named for the row of spots that decorate the flanks of the fish, "just above the waterline", are reluctant captive spawners. My view is that the regular porthole is the more so of the two. This boils down to the introductory period; the fish is timid and can have a very traumatic acclimatization. Realistically, a quarantine period is a must for this species. Yet this is in itself odd because the fish is both common and hardy. It's found in fresh, through to standing to really quite unpleasant stagnant water in the wild. Still in the wild, at the site shown left, it was to be by chance that I first encountered this fish in Peru. Mind you, most fish are met by chance! In this case it was the generator on our boat that stubbornly refused to start and, rather than sit around in the port of Iquitos, Peru, we grabbed our nets and set out for what little water was at hand. That might sound bizarre given we were shored up on the banks of the mighty Amazon, but a few hand nets are no match for her! We, in our skiff, headed for not-so-dry land. In this case, an island, just managing to rise above water level in the main river channel was our destination. 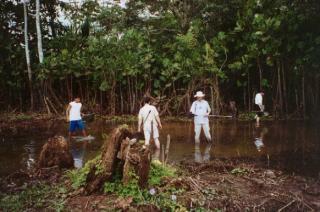 As I say, the picture shows the collection site; it was little more than a series of muddy-bottomed large puddles. What land there was around was waterlogged and had been planted with rice by the locals. So close to the city of Iquitos, we were wary of getting too optimistic. But this was early in the expedition and the weight of effort required to collect for days on end in the rainforest had yet to make any impact. The water was clear but had a soft, muddy bottom that, when stood on, submerged the ankles. The mud was layered with a few inches of leaf litter (covered in a fine layer of silt) and maybe only a few inches of water above that were clear. Many more insects than fish were visible - not a good sign - but we waded on in and out came these fish. On import though the fish can be quite weak, as a larger percentage of individuals than you would expect have difficulty adapting to aquarium foods. Once settled however, they readily adapt to aquarium life. I have a pair right now that has been happily swimming around in my aquaria since I collected them in Peru in 2000. In closing, this fish is overlooked because of the more attractive caudal colouration of the other Dianema species, but that species is larger and has a more robust temperament more akin to the other cigar shaped armoured cats. 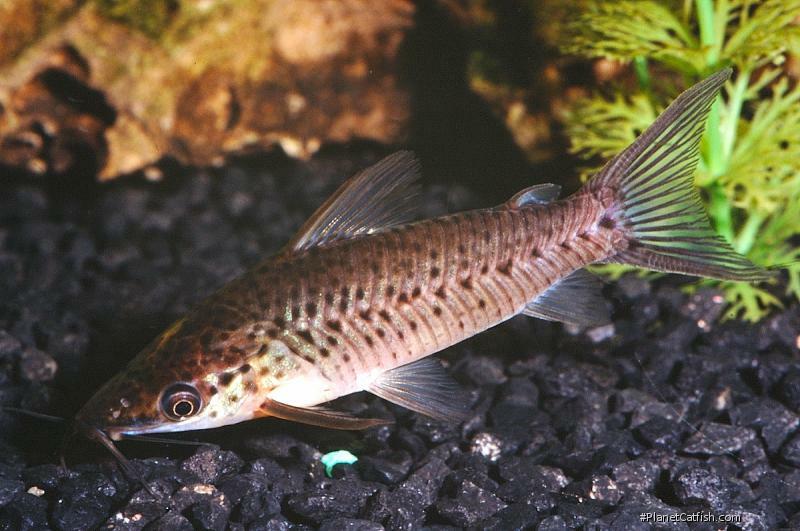 Dianema longibarbis is more demure, closely allied to the gentler Corydoras, and is something of a mid water fish. A group of them has character to spare for any community aquaria. Type Locality Río Ambyiacu, Peru. Etymology Dianema: From the Greek di-, meaning two and nema, meaning filament; in reference to the long maxillary barbels. In adults differences in bodyshape and armor are easier to spot; the pectoral shields in Hoplosternum punctatum leave a space in the center (females) or overlap (males), but in Dianema these are closely fitted together. Within the genus of Dianema: D. longibarbis Clear tail fin, the only other member of the genus has horizontal black and white alternating stripes on caudal fin and is generally larger. Sexing Females are larger than males but the difference is slight. Distribution Widespread in Peruvian and Brazilian creeks, ponds and rivers. Other Parameters A hardy species that will adapt to most conditions. Feeding Virtually all prepared foods. Feed sinking catfish pellets and frozen bloodworm specifically. Furniture Plants are necessary to make this species feel at home. It rests under their shade and will come to rest on their upper leaves as it can often be found midway up the water column. Suggested Tankmates Small to medium characins; dward cichlids. Essentially any small to medium sized community fish. Not a good armoured catfish for the larger cichlid tank; go with Megalechis or Callichthys instead. Breeding Unknown, see D. urostriata. There are 31 registered keepers, view all "my cats" data.